Yes, you read that correctly! One of the biggest pieces of news to come from E3, aside from the bucketloads of gameplay footage and commentary, is a snippet of information that should have fans of classic Tomb Raider jumping for joy: Those white ledges that fans have been complaining about since their inception are finally going to be optional! Varying between easy, normal, and hard mode will gradually fade the white paint that lets players identify ledges. This option will allow you to choose from visible white ledges, to blended white ledges, to no white ledges at all. This change might not sound like a big deal to the more casual of players, but it’s something that fans have been calling out for since Crystal Dynamics first included them in Tomb Raider: Legend, over twelve years ago. Their inclusion infuriated Tomb Raider fans who preferred to take their time and explore. The white ledges were immediately apparent and even a quick glance would inform players of the path that Lara should take. Now, these white ledges are optional, we will all have the opportunity to turn them off; getting Lara from A to B won’t be so obvious. Players who do choose to turn them off will have a better sense of exploration from Shadow of the Tomb Raider, and should be prepared to employ some trial and error in order to progress, as the traversal itself will be more of a challenge. Another feature included to increase the challenge is the option to turn off Lara’s verbal hints whilst attempting to solve puzzles – perfect for those who don’t like to be told what to do when faced with a challenge, or even for those who’d prefer to hear a bit less from Camilla during gameplay. “You remember on Rise, Lara was telling you ‘Oh, I should be doing that during puzzles.’ If you play on normal, she was just saying ‘Oh wow, I need to solve this.’ Easy will be closer to what we did on Rise, she will tell you exactly what to do. […] But on hard, she will not say anything, and nothing will be highlighted. It really looks like Eidos Montreal have gone that extra mile in order to let Tomb Raider fans tailor their own level of difficulty for Lara’s next outing. Want to breeze through the game with less time spent exploring? Use the white ledges, and leave the vocal hints on. Prefer to take your time and work things out for yourself? Then rejoice: silence Lara and turn off those shiny ledges! Shadow of the Tomb Raider releases worldwide on September 14th 2018. Meanwhile, take a look at our shot-by-shot breakdown of the latest gameplay trailer. Written by Chris Carpineti. Edited by J. R. Milward. 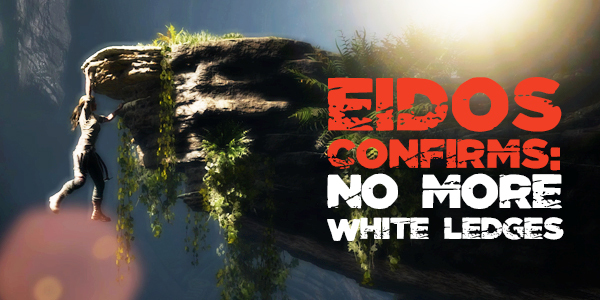 Eidos Confirms: No More White Ledges by Chris Carpineti / Survivor Reborn is licensed under a Creative Commons Attribution-NonCommercial-NoDerivatives 4.0 International License.